Thursday 8-March: By 9am we are motoring into the Glossy Bay marina where we are welcomed by a uniformed gentlemen in a smart RIB and escorted to our berth alongside. It’s all very civilized, everything new in the last year or 2. While Glen adjusts the mooring lines, Oana discovers the WiFi is lightening fast, so starts uploading videos etc, which we have not done for a while. 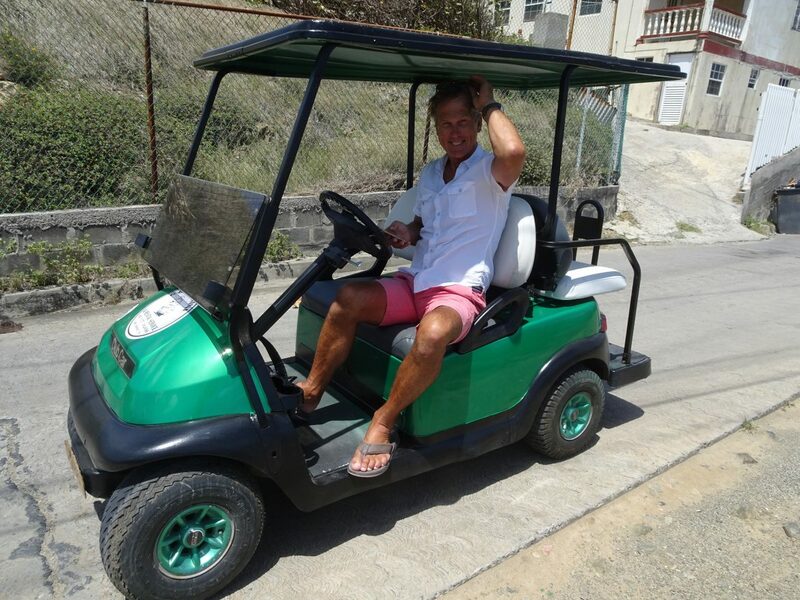 By 11am we are heading off to explore the island in (or is it “on”) our green golf cart. We soon discover that it’s not exactly speedy, but it does give us shade and it’s fun to drive. Once we are outside the security fence of the plush marina, we are back into the local rural scene. To say it’s quite a contrast would be an understatement. Charlestown is the usual mixture of run down shacks with the occasional smart dwelling among them. We later find out these smarter places are where the staff of the luxury hotel complex live. 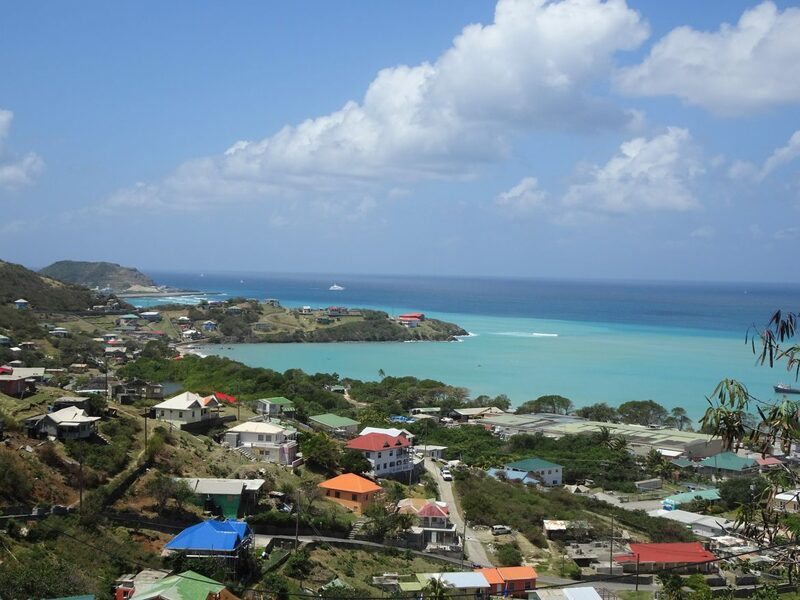 From above the village we get great views down into Charlestown Bay to the west, and out towards the Atlantic in the East, that lies behind the longest coral barrier reef in the Grenadines. 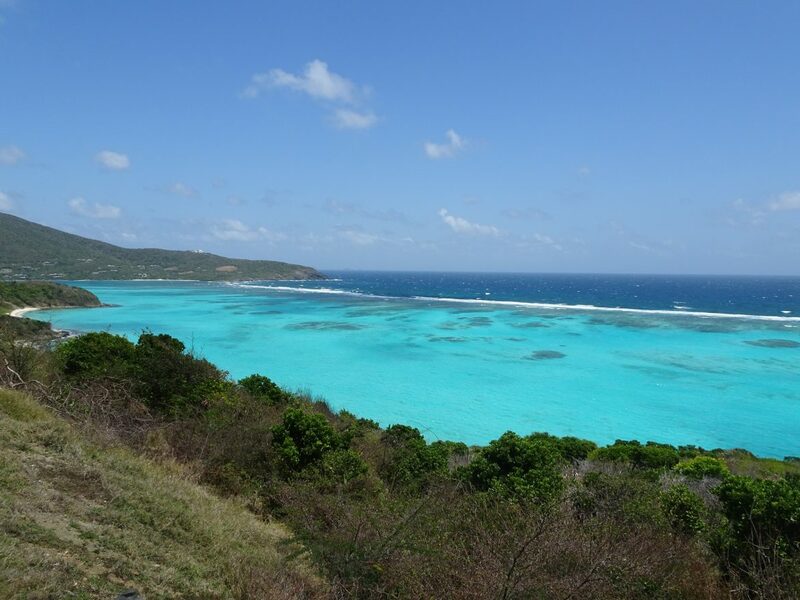 The turquoise water behind is devoid of any boats because it is designated national park. It’s actually nice to see such a place without the usual array of yachts and catamarans spoiling the natural scene. Along the coast we find a gem, an abandoned pretty beach house whose entrance is marked “Marine Research Center”. It’s very over grown but we fight our way through and into the terrace which has a spectacular view over the reef and gardens down to the white beach. But the building, pretty as it is, has been ravaged of all its electrical fittings and is totally at mercy to the salty weather. At the time, we say there must be a story behind this. And later we discover that this land is owned by the hotel resort which also owns 1200acres of the island in the north and they plan to develop this bay too. Another 100m onward we come to a security gate of this resort, called Pink Sands Hotel. Try as we might, the security absolutely won’t let us through, even with our usual lines, “we want to have lunch”, we have booked via the marine” etc. They can only advise to go to the main gate and make an official booking. So it’s back through the village and up the other coast to the main gate. But again we are foiled. It seems the only way “in” is to book a day pass at $150 each! At that, we make a swift u-turn feeling a bit defeated. We hired this buggy to see the island but it turns out that 3/4 is totally inaccessible to the public. We feel a bit sad for the islanders who seem to have been sold-out by their government. But then, apparently up till 1996 there were only couple hundred people on the island and it didn’t even have running water nor electricity! Back in Charlestown again we manage to get into the only other hotel here, the Tamarin, and have a coffee. The hotel seems deserted of guests but apparently will be busy over Easter. The 2 jetties of the hotel have been washed away by the recent swell, and the ferry jetty too had some damage done; no fresh supplies have arrived to the island for a couple of days. So we end up back at CB feeling like we have not managed to fully explore the island. Before sunset we head over to the marina bar which we had discovered yesterday. There are more boats in the marina tonight so the bar is much more active. We get to meet the crew of a Girlsforsail, 8 ladies (no men allowed apparently) and several of the crew from other yachts. It turns out to be quite a fun evening. Once they have all left, we find ourselves alone with a German couple, David & Jenifer, who just came in. They tell us they are working in the Pink Sands resort, so we proceed to tell them of our adventures today, trying to get in! Then we learn that David is the General Manager for the whole resort and we feel a bit bad telling our story. We chat for a while, and as we say our goodbyes David offers us to come and visit the resort tomorrow ! Whoopy, an offer we can’t refuse! He says a car will come and pick us up at 11am tomorrow. We can’t believe our luck. We had been a bit sleepy, but the excitement woke us up, so we decided to see what was happening in Charlestown, given we still had the golf buggy. As we pass the marina security, he advises that “Gillian’s” is the place to be Thursday evening and he explains where it is. So off we go, not expecting much. As we approach we hear the loud music, then lots of locals hanging around and dancing in the street and smoking the usual. We are about to make a u-turn but our previous cocktails make us brave so decide to go have a look anyway. It’s mostly men, and in the bar there are several domino tables with some very enthusiastic players. You wouldn’t think it possible to be enthused by dominos, but these guys surely are! We also meet the only white couple there, an Irish guy who works on the super yacht owned by the marina developer, and an English girl, rather drunk, who works for Jennifer in the resort. After chatting to some of the locals they invite us into what they jokingly call the VIP area next to the DJ, where we dance the local dance moves for a while. Well, Oana does, Glen tries! The party just seems in full swing when a guy comes with a trolley and carts off the speakers! Party over it seems. So we buggy back to CB, happy with our eventful day …. and a little worse for wear!